These juicy gems can help lower your blood pressure, keep your weight in check, and more. Indeed, stone fruits are rich in inflammation-fighting phytonutrients, which can help protect your health and even fight the signs of aging. Fun fact: They're also what give stone fruits their vibrant yellow, orange, red, and purple hues. 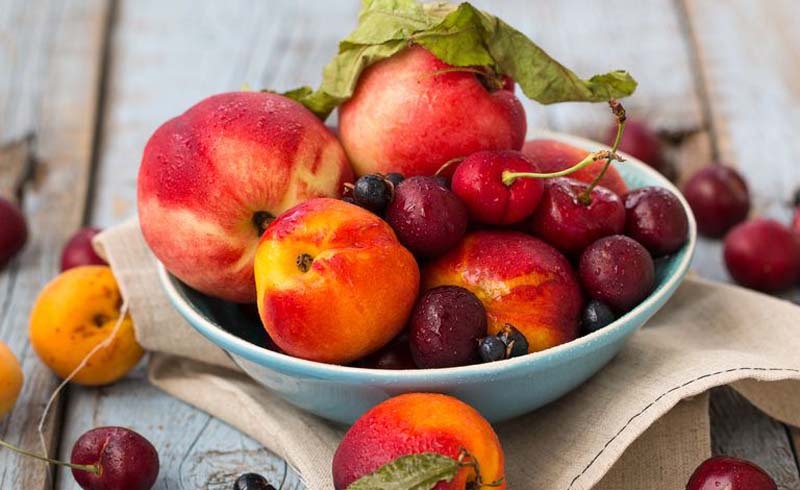 Keep reading to learn the health benefits of stone fruits, plus delicious ways you can enjoy them. Stone fruits aren’t as potassium-rich as, say, bananas. But since most Americans struggle to get the recommended 4,700 milligrams per day, every little bit you can get makes a difference, especially if you’re trying to lower your blood pressure. The mineral plays a key role in promoting healthy blood pressure levels by relaxing blood vessels and helping the body get rid of excess sodium, says the National Institutes of Health (NIH). Most stone fruits will serve up six to nine percent of your daily potassium needs. Sugary cravings standing in the way of your weight loss goals? Stone fruits are naturally sweet, but they also happen to be pretty low in calories. (Most have between 75 and 100 calories per serving.) So having a nectarine or a bowl of cherries instead of cookies or candy just might hit the spot—without wrecking your diet. Case in point? You could have four medium peaches for the same calories as a 1.5-ounce chocolate bar, says registered dietitian Sarah Pflugradt, MS, RD. Stone fruits are also a good source of fiber. You’ll get around three grams of fiber from a cup of sliced apricots, a cup of cherries, or a large nectarine. That’s important, since fiber is key for filling you up and helping you keep your weight in check. Roughage plays an important role in improving your cholesterol and lowering your risk for heart disease, stroke, and type 2 diabetes, the American Heart Association says. Apricots and mangoes serve up beta-carotene, a form of vitamin A that plays an essential role in eye health. "It’s been shown to absorb damaging blue light that enters the eye from computers and cell phones,” says nutrition expert Amy Goodson, MS, RD, CSSD. "You’ll get around half of the amount of vitamin A you’ll need in a day from just half a cup of fresh apricots." 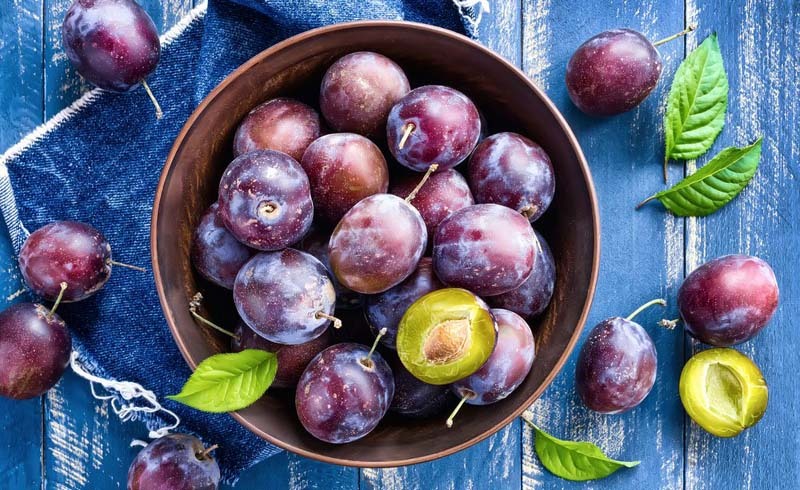 Cherries and plums are rich in anthocyanins, disease-fighting flavonoids found in dark red, purple, and blue fruits and veggies. Evidence suggests that anthocyanins may offer protection against cancer, heart disease, diabetes, and cognitive decline. Peaches and nectarines are packed with vitamin C, which helps prevent cell damage and aids in the production of skin-smoothing collagen, Goodson says. You’ll get around 15 percent of your daily vitamin C from a large peach and around 10 percent from a large nectarine. Grill them. Halved and pitted peaches, plums, apricots, and nectarines are firm, so they hold their shape even under high heat, Pflugradt says. Try serving them in a side salad with grilled steak, chicken or pork chops, or blend them into a smoothie with Greek yogurt for a filling treat. Roast them. Toss halved or chopped pitted stone fruit on a baking sheet, drizzle them with some olive oil, and roast until soft, juicy, and caramelized. Toss them in a salad or stir them into cottage cheese or plain yogurt. Add them to salsa or guac. Diced peaches or pitted cherries lend a sweet contrast to zesty salsas. Make a crumble or crisp. You can’t go wrong when you top sliced or diced pitted stone fruit with a mix of oats, nuts, brown sugar, and butter, and bake until bubbly.